Despite a series of trades and graduations, the Yankees still boast one of the best farm systems in baseball, a farm system both Baseball America and Keith Law rank as the second best in the game. Only the hard-tanking Braves have a better farm system. The Yankees are World Series contenders with a young MLB roster and lots of prospects. It’s an exciting time. As I put together my annual Top 30 Prospects List — that’ll be posted tomorrow, so get excited — the thing that stood out most to me was the quality of the prospects that didn’t make the top 30. There are some really good prospects who, in years past, would’ve been easy top 30 prospects. Top 20 in some cases. Now they don’t crack the top 30. It’s pretty amazing. The Yankees have such a deep system. Deep in power arms, especially. Before we get to the top 30 tomorrow, we’re going to look at five prospects today who didn’t make this year’s top 30 list but could make next year’s. These are my Not Top 30 Prospects. Only one of last year’s not top 30 prospects made the jump into this year’s top 30, though, to be fair to me, two others would’ve made the top 30 this year had they not been traded. Just to be clear, these are not prospects 31-35. These are five prospects who didn’t make my top 30 this year, but I think have lots of talent and ability, and thus a chance to make the top 30 next year. I wouldn’t necessarily call these guys sleepers. Let’s call it a watch list. That sound good? Good. Here are this year’s not top 30 prospects, listed alphabetically. The 20-year-old De Paula came over from the Mariners in the Ben Gamel trade and he made his organizational debut with Short Season Staten Island last year, posting a 2.90 ERA (3.08 FIP) with 21.0% strikeouts and 9.9% walks in 62 innings despite being one of the youngest pitchers in the league. He’s lanky at 6-foot-3 and 165 lbs., and he stands out more for his pitching know-how and ability to keep hitters off balance than his sheer stuff. De Paula works in the low-90s with his fastball and has a promising changeup and curveball, with the change ahead of the curve. He’s working to gain consistency with everything right now. I get the feeling that, once he fills out a bit and adds some velocity, De Paula will really take off because he already knows how to pitch and get outs with his present stuff. Once the stuff improves, he’ll be really dangerous. De Paula is probably ready for an assignment to Low-A Charleston this season. The Yankees signed the 20-year-old Garcia to an undisclosed bonus in July 2015 — his bonus couldn’t have been larger than $300,000 because the Yankees were still in the penalty phase for the 2014-15 international signing spree — after he’d been passed over during the 2014-15 signing period. He split last season between Rookie Pulaski and Low-A Charleston, throwing 75.2 innings with a 2.50 ERA (3.74 FIP) and a good walk rate (5.5%), but a not-so-good strikeout rate (18.2%). Rony is a big kid at 6-foot-3 and 200 lbs., and his top pitch is a hard low-to-mid-90s cutter that has touched as high as 97 mph. He controls the pitch well — lots of young pitchers struggle to locate cutters — and backs it up with a slurvy breaking ball that is stuck between a slider and a curveball, and a nascent changeup. Garcia, like many kids his age, needs to improve his secondary pitches more than anything. The ingredients are there for a really good pitching prospect. Rony figures to head to Low-A Charleston to begin this coming season. Olivares, 20, signed for $400,000 as part of the 2014-15 international class, and he spent last season dominating with Rookie Pulaski (.363/.495/.488/174 wRC+ in 23 games) and getting dominated with Low-A Charleston (.160/.233/.210/33 wRC+) in 36 games. He’s listed at 6-foot-0 and 160 lbs. but is probably 10-15 lbs. heavier, and although he has no true standout tool, Olivares does just about everything well across the board. His right-handed swing is balanced and he has sneaky good pop, he works the count, he limits swings and misses, and his speed and defense are good enough for center field. On top of that, he knows the game well and his tools plays up thanks to his instincts. The Yankees will probably send Olivares back to Low-A Charleston this season, and now that he has some more experience and got a taste of the level last year, he could put together a season that will land him in many “biggest surprise performers” conversations. This makes three former Mariners farmhands in the last two not top 30 lists. Weird. Zack Littell (James Pazos trade) made it last year, and this year both De Paula (Gamel trade) and Then (Nick Rumbelow trade) are in the not top 30. Anyway, Then is a soon-to-be 19-year-old right-hander who has yet to pitch in the United States — he had a 2.64 ERA (2.90 FIP) with 22.9% strikeouts and 6.1% walks in 61.1 innings in the Dominican Summer League last year — and he signed for only $77,500 two years ago. Those usually aren’t the hallmarks of a quality prospect, but Then is an exception. He’s already quite polished for a teenager, with good pitching aptitude and an understanding of how to set hitters up. Then works in the low-90s now and he figures to get into the mid-90s consistently once he fills out his 6-foot-1 and 155 lb. frame. His changeup and curveball are both already quality pitches. The biggest development goals for Then is refining his delivery and improving his overall command. The Yankees will bring Then stateside this year and hold him back in Extended Spring Training before assigning him to one of the short season leagues when their seasons begin in June. 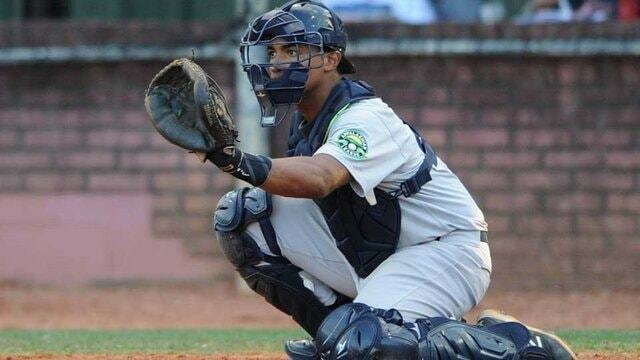 The Yankees are thin behind the plate at the moment and it’s probably not reassuring to hear that Torres, who hit .174/.230/.309 (45 wRC+) with Rookie Pulaski last year, is their top catching prospect. The soon-to-be 19-year-old signed for $300,000 two years ago and he does his best work defensively. His arm is strong and accurate, and he already has a reputation for working well with pitchers and executing a game plan. Torres has some thump in his bat — six homers in 191 plate appearances as an 18-year-old catcher ain’t nothing to sneeze at — and more offensive potential than last year’s performance with Pulaski would lead you to believe. It is not at all uncommon for a young catcher’s offense to lag because they spend so much time working on their defense early in their careers. Torres is easily the most defensively advanced catching prospect in the system and he probably has the most offensive upside as well. I think it’s likely he starts the year in Extended Spring Training before joining a short season league team. An assignment to Low-A Charleston would surprise me.